Well, that’s exactly what you get when you choose Anchor kitchenware! Still proudly made in the good old U-S-of-A, Anchor is built tough and designed to last through pretty much anything that goes on in the kitchen. That means it’s freezer safe, microwave safe and oven safe, and you can even put it in the dishwasher to clean (after all, an anchor’s just no good if it can’t handle a bit of water). As kitchen essential, the mixing bowl has pride of place somewhere between the wooden spoon and the chopping board. Anchor’s Mixing Bowls come in a variety of sizes, for whatever you happen to be cooking up, and are made from Anchor’s tough tempered glass, which they call “Anchor Hocking Glass”. 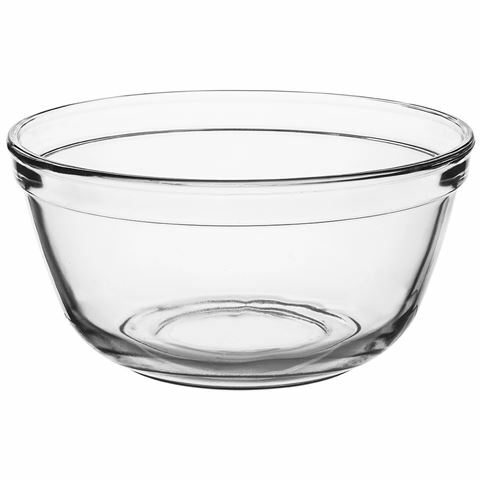 This solid Mixing Bowl will make you feel like a true baker. Made from Anchor’s tough tempered glass.